Posted by V the K at 8:46 am - November 18, 2017. 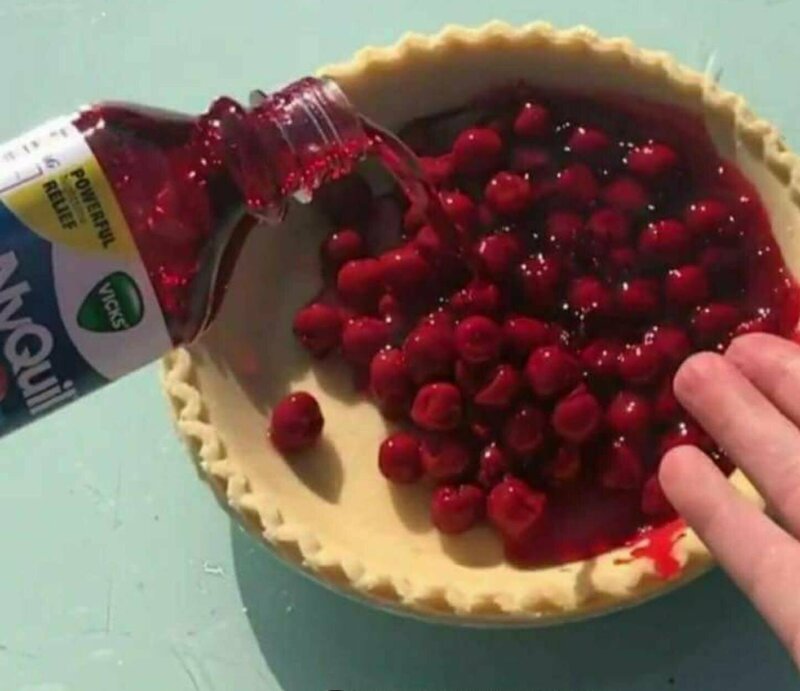 Put Nyquil in their pie? Funny thing, I’ve never run into a jerk who wants to start a political discussion at Thanksgiving. I HAVE run into quite a few liberal columnists who want their readers to, however. Jerks. You’d rather disrupt a family get-together than defend your views yourself. Jerks. Double jerks. Triple jerks. But, unfortunately, typical of the left. The left does not want to help others with their own money, they want to help others with YOUR money. The left does not want to allow illegal immigrants onto their own property, they want to have them on everyone else’s. The left wants taxes raised on the rich, as long as “the rich” does not include themselves. The left want everyone ELSE to do what they want, but they exempt themselves from the same requirements. The purpose of the Nyquil, Pawfurbehr, it to calm them down, make them sleepy, so they take a nice long nap after the meal, rather than ruin everyone else’s celebration with their poor debating skills. LOTS of Rum will do the same, and you have the option of setting the table aflame! To Leftist family member – What Thanksgiving? No family is going to celebrate something associated with Pilgrims – that would be awful. To everyone else: Lunch will start at 11:00 am. That was a joke as the good news is we don’t have any Leftist SJW crybullies in my family. The closest to the Left is actually me who is an Independent. @5 This is why I love mince pie. You can hide a LOT of brandy and rum in one of those. I’m dreading Turkey-Day and Christ-mass Day this year with my Libertard relatives, fortunately they’re only here for dessert. I feel the need for a ritual exorcism after they leave just to purge my home of the progressive-vibes and the howling self-serving hypocrisy; the whole Bell, Candle and Book with Gregorian Chant canticle. @ 8, Same here Ted B, I’d rather make alternative plans! @8. I can also relate Ted. We will be spending Christmas this year with our FAR left daughter and son-in-law. She has still not forgiven us for voting for “that Nazi and sexual predator who is going to start WWIII.” I never bring up politics or religion when we are together but we always seem to make her upset. Plus, of course they are vegans. I may add the NyQuil to my own dessert this year. @ Ted B.: Don’t forget the “Vade retro satana” chant. Very important part of any proper exorcism. If any friends or family bring up politics this break, I intend to repeat, very loudly, “Kill them all, God knows his own” every time they do until they get the hint. It’s been over 15 years since I have visited my liberal-to-far-left relatives for any holiday. 25 years of political abuse was enough. Mom and Dad have passed on so there is no longer even the need to visit to make them happy. …That works even better if you just publicly-mutter under your breath emphaticaly often, and shift your eyes back and forth between the worse-offenders.